Following yesterday’s sugar overload, I wanted to make something fresh and fast and healthy. 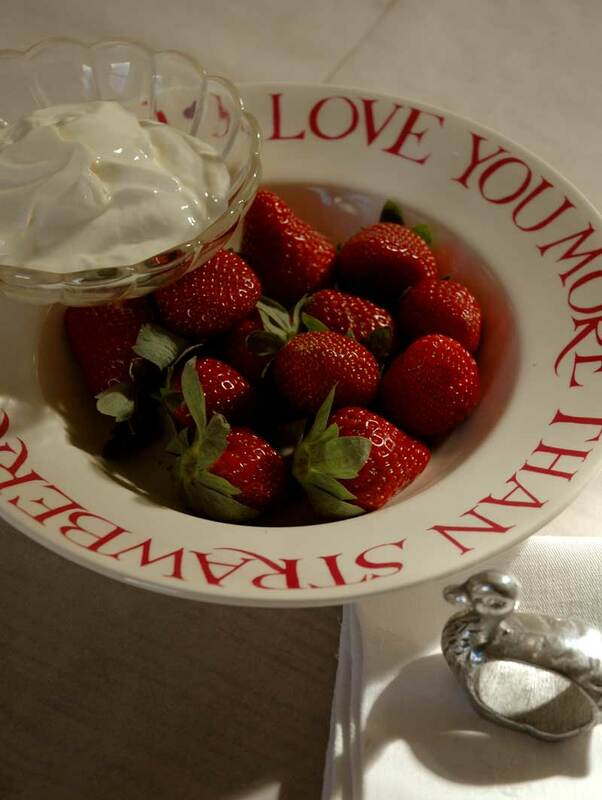 So this morning’s breakfast consists of love and a punnet of strawberries. The berries are out of season, and therefore not cheap, so there’s also a bit of cash involved in delivering the love. Strawberries repay by supplying vitamin C and fibre. And their colour always gladdens the heart. But I bet you didn’t know that their leaves and roots boiled in wine and water do ‘cool the liver and blood, and assuage all inflammations in the reins and bladder’, or that they are said to be excellent for soothing red, inflamed eyes, and indeed sore mouths, and ulcers. This advice comes from Culpeper’s Complete Herbal & English Physician. While the recipes and claims in Culpeper’s Herbal often sound outrageous to modern ears, his language is the language of Shakespeare and the text is a gorgeous read. Besides, who could fail to empathise with a man who, when eloping, arranged to meet his true love under a massive oak, only to gallop through a stormy night to find her body at the foot of the tree: both sweetheart and oak had been struck by lightning. So if like me you love the idea of herbs with names like Adder’s Tongue, Rushy Glonde, and Viper’s Bugloss, here is a link to Culpeper’s Herbal. You can browse it while you nibble strawberries. 18 Jul	This entry was published on July 18, 2012 at 7:37 am. It’s filed under Uncategorized and tagged beautiful breakfasts, creative writing, culpeper's complete herbal, food writing, strawberries, winter, yoghurt. Bookmark the permalink. Follow any comments here with the RSS feed for this post.